You’re almost certainly feeling breathless at times, because of the pressure of your growing baby and uterus on your lungs. Your belly button is either stretched flat or sticking out. If you have belly button piercings, it’s a good idea to take them out if you haven’t already. daily care essentials – baby wash (non-soap is best), cream for baby’s bottom, sorbolene cream for dry skin and a thermometer. Most hospitals will give you a list of baby equipment. Birth classes will also help you go through the basics. A freezer full of food is another good ‘baby basic’. You’ll have your hands full feeding baby, so it’s great if you’ve got something nutritious to feed yourself and other family members. If you’re planning to give birth in a hospital or birth centre, think about packing your bag now. Essentials include hospital admission forms, maternity pads, pyjamas and some basics for baby (singlets, socks, tops and bottoms or one-piece suits, large cotton or muslin wraps). You might also want to put in some things for labour – old, oversized t-shirts, extra undies, warm socks and lip balm. Easy-open tops for breastfeeding, along with a maternity bra and breast pads, are also a good idea. If everything’s going smoothly, you’re not likely to need any more ultrasound scans after 18-20 weeks. But if you’re having twins or more, if you have a medical condition like gestational diabetes or pre-eclampsia, if there are concerns about the growth of the baby, or if you’ve had problems in previous pregnancies, your doctor, obstetrician or midwife might suggest extra ultrasound scans. 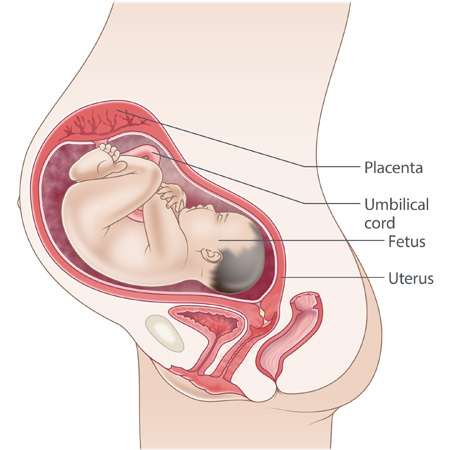 If your baby is lying in the breech position towards the end of your pregnancy, your health professional might also recommend another scan to check why your baby is in this position and where your placenta is. Your baby is about 28 cm long from head to bottom, and weighs about 1.7 kg. Your baby is still putting on fat beneath the skin, looking plumper all the time. Your baby might be head down now. If not, don’t worry. Many babies leave it until the last moment to turn around. Quite a few babies are in the breech position at birth. Your baby’s eyes are a dark grey or blue colour. They’ll change in the weeks after birth, but you won’t know the final colour until about a year after birth.